We often give the advice that when you’re ready to take your property to the next level with landscape lighting, or even just toying with the idea, start small. Dip your toes by selecting one area of importance to light rather than the whole nine yards. This tends to be the backyard to add a level of security by warding off possible intruders. A very close second is illuminating areas and features that may be difficult or hazardous to navigate without outdoor lighting, such as pathways, stairways and steps. This adds a needed element of safety, allowing people to navigate a property more easily. Adding light to your balcony staircase, a patio doorstep, or beautifully hardscaped steps to a pool or entertaining area eliminates danger and potential injury. Outdoor lighting also adds a beautification factor that can set a mood and truly make a home stand out while adding value to the property. Does Landscape Lighting Work for Me? Maybe you like the idea of adding landscape lighting, but you don’t think there is room or can’t it be retrofitted into your landscape and hardscape design. This shouldn’t deter you in the slightest. Landscape lighting is all about creativity and problem solving. A lot of the time, landscape lighting is added after the fact to existing structures and landscapes that weren’t necessarily designed with outdoor lighting in mind. Post lights, down lights or moon lights, and core lights are all fixtures used for outdoor step lighting that are invaluable to every landscape lighting system. With all that said, now you be asking, “How do I choose which lighting fixture or technique is best for my application?” The short answer is not the simplest one. It all depends on how you are using the space where the steps or stairs are located and what effect you are trying to achieve beyond creating a safer environment. This is where chatting with a professional comes in handy—especially if you’re unsure of which lighting technique you want to use, which effect would look best, and what would be most effective overall. A lot of the time step lighting is accomplished not by adding lights to the actual steps themselves, but alongside them. This is otherwise known as path lighting—afterall, a stairway is a form of a path! Path lighting is a basic landscape lighting technique which uses path or area lights. Often times, the purpose of path lighting is to light planting beds and paths to provide seamless transition between lighting scenes for both safety and cohesion. One recommendation is to alternate placement of path light fixtures from one side of the step to the other to light the path evenly and attractively. The goal is to provide enough illumination to prevent tripping hazards, but also to space fixtures far enough apart to create distinct pools of light so your eye naturally moves through the space. Lighting both sides of each step, on the other hand, is not aesthetically pleasing and feels unnatural when walking along a path. Another way to light steps or stairs is downlighting. A more advanced downlighting technique is known as moonlighting. Moonlighting uses tree lights with the purpose of providing soft natural lighting over large areas. Moonlighting serves as an ideal transition connecting different lighting scenes together and eliminating black holes from the project, and again, providing safety and cohesion. To successfully create a moonlighting effect, fixtures should be placed in a tree at least 25 feet high—at least two lights per tree—and directed down onto the stairway. Hardscape lighting is also exactly how it sounds: Using engineered wall lights within stones, or a hardscape, steps and stairways can be lit safely and evenly using hardscape lighting. This is a lovely and sophisticated way to light outdoor steps while highlighting thoughtful hardscape design. Either the walls on both side of a stairway or the stairs themselves can be lit with hardscape lighting, which brings us to our fifth way to light outdoor steps: tread lighting. These fixtures are exactly how they sound: They mount onto a post of railing of a stairway, effectively illuminating the path beneath them. One type of post rail light fixture that CAST offers is actually a deck light, which serves the same purpose and blends nicely with a wooden or metal railing. Be forewarned, though, installation and wiring of post rail fixture can get complicated and if the drilling and fishing isn’t done properly, it could result in a permanent and unsightly mistake such as a hole drilled in the wrong spot. Thus, we recommend working with a professional on this kind of lighting project. Tread lighting is a type of stair lighting that uses step lights, strip lights, or slim hardscape lights. These strips of light that are placed under each step, washing each one with a gentle, even glow that gives it the illusion that it is floating. This is a dazzling and unique light effect that offers a customized look enjoyed by many. We briefly touched on this top takeaway in our post rail lighting section—and that’s the consideration that all three of the above lighting installs require precision and technical prowess. Our #1 takeaway here is to make sure to consult a professional landscape lighting designer before trying your hand at this outdoor step lighting. It’s critical to select the right fixture and lighting effect to safely and beautiful illuminate your steps. And to take it one step further, it’s just as important to wire and mount the fixtures at the proper height and beam angle—then test and tweak the lights at night—to ensure a successful lighting project. Good luck, have fun, and enjoy the results! Low voltage landscape lighting is an essential addition to any landscape. It extends the hours that you can enjoy your outdoors, as well as adds another dimension of BEAUTY and added security to your property. Below you will find some of the top trends in landscape lighting for 2018. Spring is just around the corner and we’re excited about what’s to come. We’ve compiled a short list of the biggest landscape lighting trends to come in 2018. From what fixtures are in to what technology is out, we’ve covered it all. So make sure to keep an eye out as you drive through neighborhoods this coming season, visit friends, and peruse properties for landscape lighting inspiration. We think you’ll find the following trends are hot, hot, hot! Outdoor light fixtures earth tone-coated to match your landscape are on the decline. Instead, brass, bronze, and copper are the homeowner’s fixture of choice. The look of today’s fixtures are moving away from trendy and returning to timeless. Brass, bronze, and copper fixtures offer more class and natural beauty as they age with a lovely patina, which is now the coveted look. Of the three, solid bronze light fixtures steal the show, however: Not only are they stunning to look at and admire, they’re an extremely durable and weather-resistant product compared to some of their inferior alternatives made of subpar material like aluminum. Even copper and brass fixtures are known to bend, corrode, and even break, making bronze the most superior quality of the timeless trio, impervious to damage and corrosion. Today, we’re seeing a major shift in favor of outdoor living: outdoor kitchens, outdoor living rooms complete with rugs, pillows, and throw blankets, and expertly hardscaped fire pits. According to a Houzz study, 83 percent of backyards were being transformed into primarily outdoor entertaining spaces with 73 percent focused on becoming outdoor eating spaces, 53 percent being remodeled into outdoor living rooms, and 48 percent included barbeques and/or fire pits for added touches of ambiance and functionality. As such, these outdoor living spaces require professional outdoor lighting design and installation. Homeowners spend a great deal of money on these outdoor living spaces and the best way to make the most of this investment is to make sure it can be used at any time with landscape lighting. Not to mention, the trend has never been to wash out scenes with one-dimensional lighting, it’s to create depth and emotion and to create specific moods in specific areas for specific tasks—like a intimately low-lit area with a hot tub or a lively dining area where bright light is needed to entertain, grill, and keep energy high. This is hard to achieve without the knowledge and expertise of professional designers and top-quality products. Halogen lamps are the way of the dinosaur—put out to pasture by LED technology. It’s been a long time coming, but now 90 percent of our fixtures are being paired with LED lights, truly showing how extinct halogen lamps have become. Halogens are known for power inefficiency, burn outs, their inevitable replacement, and, of course, heavy maintenance in comparison to LEDs. LED lights are now known for their energy efficiency, reliability, and can look identical to the warm halogen glow people are attracted to. But make no mistake, the reality of purchasing and using LEDs is not so rosy, though. The LED faces issues with light, heat, moisture, color, false manufacturer claims, and a capable fixture to protect them. It’s important to do your research and buy quality LEDs. Today, most homeowners are opting for astronomical timers over analog timers and photocells. And why wouldn’t they? Analog timers and photocells are fairly accurate and a tad cheaper, but antiquated in comparison; for that little extra investment, homeowners can get the best technology available, and we encourage them to do so. Photocells sense when light is diminishing, and when it hits a certain level, the landscape lighting system is turned on. Meanwhile, analog timers—the ones that look like old-school dial timers used in the kitchen—are truly archaic in comparison to digital astronomical timers. Astronomical timers are by far the most sophisticated, precise, and reliable of the bunch, requiring you to program the GPS coordinates of the property or its zip code to determine exactly when the sun rises and sets no matter the time of year. You can even program them to adjust for daylight savings. So, for a little more legwork in the beginning, you get the most accurately timed system every day. Some people may ask, why are timers even needed at all? The simple answer is: for convenience and security. Rather than manually turning a system on or off, a timer makes the process effortless. Additionally, a major reason why folks install landscape lighting is for security. Ensuring that your system is turned on at dusk—when a homeowner may not be home to manually turn it on—helps ward off potential incidents that are encouraged by unlit houses. Spring 2018 is all about implementing the best—the best landscape lighting design, techniques, products, and installation. From the types of fixtures purchased and the LEDs that are paired with them to professional installation and timer programming, it’s all about implementing the best design tools and team to make outdoor living spaces—and an entire property as a whole—safe, secure, beautiful, and usable. These Landscape lighting tips for fall and winter will help you maximize the enjoyment you can get out of your landscape lighting, especially during the time of year where it’s usually dark before you even get home from work… Keep your yard beautiful and Safe with these these great tips from out friends at CAST. With less daylight this time of year, landscape lighting is the perfect way to continue enjoying this gorgeous fall weather, foliage, and your outdoor living space. Here are some helpful autumn landscape lighting tips to keep your property beautiful, safe, and ready for camp fires, s’more roastin’ and mulled wine sippin’. 1.Keep wires underground: Buried lighting wires may have become unearthed over the summer months. Before the leaves really start to fall, scan your property for exposed wires. This ensures you are up to code, which requires wire to be buried a minimum of 6 inches deep. This also ensures overall safety. Exposed wire can be a tripping hazard, and wild animals or pets could chew on it. In either scenario, not only are you threatening people and animals with electrical dangers, you risk shorting out your landscape lighting system. 2.Maximize leaf peepin’ season: While still illuminating peak foliage, no real adjustments need to be made. Instead, what we do recommend is taking out that rake to keep your lighting fixtures free of leaves so they can do their job. It’s one small thing that can make a huge difference in keeping your house safe, beautiful, and ready to go for fall nighttime activities! 3.Dim it down: When the leaves fall, your landscape lighting design needs to be adjusted just a smidge; highlighting the bare branches can be dramatic and severe. It’s great if you’re going for a haunted house effect for Halloween, but if the holiday’s over, consider adjusting the brightness of your lights and adding frosted lenses. Alternatively, you could disconnect or remove some of your fixtures or bulbs to soften this unintentional harsh effect. Finally, you could adjust your uplighting. Most of the time, you can simply lower the angle of the light so it illuminates the trunk of the tree rather than highlighting the grim, bare branches. 4.Create a guided path: The autumn leaves are absolutely stunning, but they can be slippery when wet. Consider adding path lighting to your autumn landscape lighting to help prevent any unwanted “fall” activities. 5.Kick it up a notch: Upgrade your light fixtures to the best quality available—switch to cast bronze. Cast bronze fixtures are beautiful and ultra durable—especially when considering those Northeast winter months. Bronze is an alloy that contains 88 percent copper, 6 percent tin, 2 percent zinc, and 3 percent lead. Adding tin to copper makes this metal stronger and impervious to corrosion, perfect for the outdoor environment. Once installed outdoors, the metallic bronze darkens to an old-penny brown, then to a greenish blue patina that elegantly complements the natural beauty of your property. While you can switch to bronze fixtures at any time, if you’d like that gorgeous patina for next summer, it’s best to install them in the fall as the aging process takes several months. The additional presence of rain, snow, condensation on the fixtures will help expedite this and set you up perfectly for the upcoming summer. 6.Make everything shine: If you’re someone who is already using bronze and wants to keep that shiny finish and prevent the patina process, there are two methods to follow. One is to clean the metal before installation and apply an outdoor-rate polyurethane matte-finish clear coating. The other is to apply WD-40™ regularly with a rag about every three months. 7.Make chilly nights warmer: Add uplighting and downlighting to your landscape lighting design to create a warm environment perfect for spiked cider and eggnog. Adding these new lighting elements can help truly transform an outdoor entertaining space. But be forewarned: You might need to stock up on extra wool blankets and firewood because guests will definitely want to spend more time in your backyard! 8.Perform annual transformer and system maintenance: Make it a part of your autumn landscape lighting upkeep routine. Remember to tighten all screws on both sides of your transformer’s terminal blocks; visually inspect any exposed wire for damage; clean any accumulated debris from inside cabinet housing; check the time clock programming and replace the battery; clean the photocell and prune any plant material obstructing the light fixtures; and adjust fixtures that might have been hit or moved. Ultimate Outdoor Living & Entertaining Backyard Paradise at night!!! 9.Fall back into a new timer schedule: It’s that time of year again when you’ll need to adjust your outdoor lighting timer. Most timers are set to automatically turn your landscape lighting on at dusk and turn off after a certain number of hours. With the clocks falling back soon, remember to account for the shorter days and update your lighting schedule so that guests (or even family members) don’t come home to a dark house. Also set the schedule to accommodate for leaving for work or the school bus in the dark. From routine maintenance checks to upgrading your light fixtures and adjusting your landscape lighting design, There are so many things you can do during the fall season to make your property safe and festive. Some are “must-do” annual maintenance checks, some are recommended property care and lighting design recommendations, and others are suggested upgrades and add-ons. No matter your budget, we’ve listed some of the top to-dos this fall to keep your home safe, sound, and stunning. Happy Fall! This Amazing Dream Backyard Project features just about all the options you have ever dreamed about having in your very own backyard. We just recently completed this project and as you can tell from the video and photos below it’s quite the dream backyard. But dreams can came true, and for these homeowners they certainly have. So proud of our team for coming together and installing another amazing backyard paradise. The outdoor living area features everything from fire to water and includes multiple travertine patio areas, flagstone and travertine walkways, stone steps, pondless waterfall, landscape lighting, outdoor audio, fire pit, and landscaping. To think were the project came from a decrepit old deck to this beautiful work of art is almost unreal! The dream backyard project included the installation of various hardscape items including travertine patio, Seating walls, Steps, and walkways. The patio material is silver travertine laid in French pattern. The patio area is approximately 1,012 sq ft with antiqued finish and natural edge. All walls and steps are constructed using natural stone Semco ‘Cedar Ridge’ sawn wall stone. Caps and stair treads are constructed of natural stone ‘Chateau Limestone’ 2″ thick and 14″ deep, thermal top and rock faced edges. Cap stone for grill wall is 18″ wide polished and sealed top. Under grill area the patio is outdoor ‘wood look’ porcelain tile. A Semco ‘Cedar Ridge’ 57″ Fire Pit with Large Zentro ‘Smokeless’ insert is installed on the lower patio area. As of these pictures and this video the fire pit insert has yet to be installed. Sealing of Travertine surfaces using GST stain blocking sealer will be completed once the project is entirely finished. Stepping stone pathway to the side of the home is full color Pa Flagstone irregular steppers. Landscape beds, plants, trees, edging and mulching was done around the entire back and side yards of the home using triple cut bark mulch. Plant variety and size specifications were all chosen by our amazing designer Wes. The landscaping portion of this project also included the grading, lawn repair, and seeding of all the areas damaged and disturbed during construction. A 15′ pondless waterfall was installed into the new landscape to the side of the lower patio for maximum viewing. The waterfall features approximately 15 foot of stream with multiple waterfalls. Two side by side spillways merge into a wide stream with a small waterfall before turning and going into the final falls at the basin area. 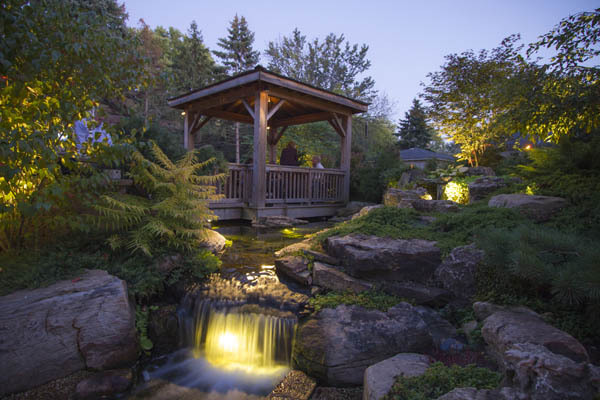 The Waterfall is outfitted with low voltage LED underwater landscape lighting throughout. The Outdoor Sound System installed was a TRU Audio 4 speaker system and 12″ outdoor hardscape subwoofer. This system also includes the amplifier which is located in the home owners basement as well as Apple Airport Express and Blue Tooth Connection. Siding work to be completed is still unfinished as of the time this video and pictures were shot. Siding was removed and salvaged in areas need for the patio and electrical work. Siding in areas of new outdoor living space to include: new vinyl siding on entire rear kitchen/bathroom wall from top to bottom as well as Piecing in around lights and sliding door on adjacent wall and in back of garage. LED Garden lighting is an essential addition to any landscape. It extends the hours that you can enjoy your outdoors, as well as adds another dimension of BEAUTY and added security to your property. 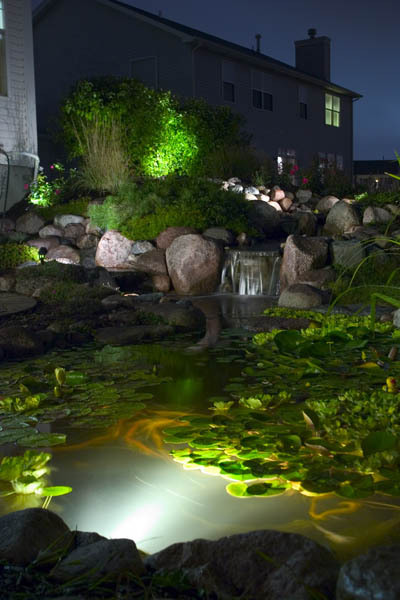 Water features are stunning during the day, but when pond and LED garden lighting is used to enhance evening views, you’ll find the landscape takes on a whole new dimension! Tuck a spotlight behind a waterfall and the feature takes on a magical feel. Used in the main portion of a pond, you’ll enjoy watching fish dart in and out of the lights. As the sun begins to set, pond and garden lighting creates a magical mood in the landscape. Think of that vacation you experienced at the beach, and the serene feeling you enjoyed watching the moon cast a glowing trail over the ocean’s surface. 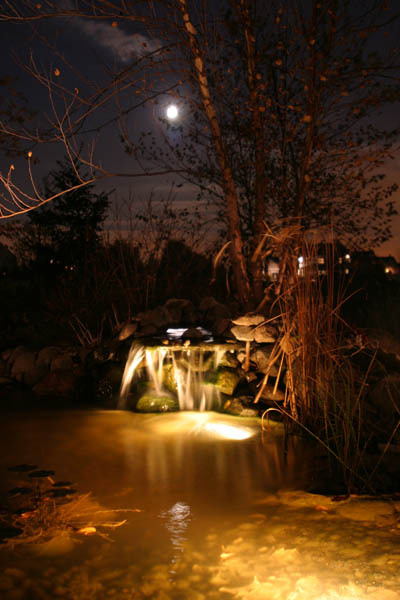 When you add waterfall or underwater lighting to your water feature, you extend your viewing pleasure well into the evening. You can add lights during the installation of your water feature, or add more later if you see dark spots you’d like to highlight. Although moonlight casts its own soft glow on your water feature, waterfall and garden lighting shows the details of the rock and water. It’s always a joy to watch fish swim in and out of lights. Be sure to incorporate LED lights which use approximately 80-90% less electricity and last 10 times longer than their halogen counterparts. To make lightscaping easier, lighting kits are preassembled and pre-wired, making installation a snap. Simply plug in the transformer, and your lights are ready to go. You can also incorporate a photocell to put the lights on a timer. If you come home after dark, your water feature will be all lit up for you! Place a single bullet light in a container water garden or fountain bowl for a dramatic and interesting effect. 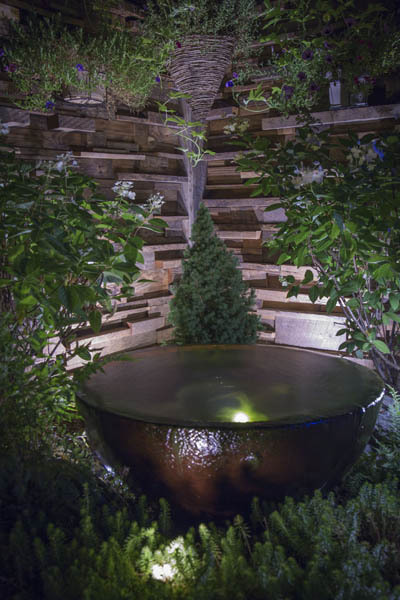 Be creative with your garden lighting options and you’ll find you enjoy your water feature during the evening hours just as much as you appreciate it during the daytime. Don’t let biting mosquitoes keep your clients from enjoying time outdoors with family and friends! The NuTone Haven Mosquito Repellent System features innovative landscape fixtures that provide season-long, effective protection from mosquitoes without the hassle of sprays, messy traps to clean, or fuels to deal with. Each fixture provides 110 square feet of coverage and is safe to use in any outdoor environment. Your clients will thank you! The basic idea of the haven system is this: Create a perimeter with the repellent fixtures (spaced 10-12 feet apart), wire them together with low voltage wire (just like a lighting system), and connect them to a 12V transformer (also just like a lighting system). Turn the system on, and within 15 minutes the mosquitoes are GONE, and will stay away until you turn the system off. For most users, repellent bottles in each fixture should need replaced only once per season. Learn how to turn your backyard into a Haven with the Haven Backyard Lighting & Mosquito Repellent System. It provides effective, convenient, season-long mosquito protection, with or without low voltage landscape lighting. Haven Backyard Light & Mosquito Repellent Fixture combines attractive, efficient LED lighting with mosquito repellency, to enhance your patio, deck or yard. Includes one repellent cartridge. EFFECTIVE: Haven’s patented mosquito protection system provides protection within 15 minutes of use and is effective against all types of mosquitoes, including the Aedes aegypti mosquito, a known carrier of the Zika virus. CONVENIENT: Odorless, silent, invisible during use – no smelly oils, smoke, or zapping sounds to disturb you. SAFE: Child-resistant fixture opens with screwdriver. Repellent won’t harm plants, flowers, shrubs or lawns. SIMPLE TO USE: As easy as turning on the lights to say goodbye to biting mosquitoes. EASY TO INSTALL: Each fixture is designed for easy insertion into cable connectors and comes with adaptors to fit most existing wiring systems and transformers. 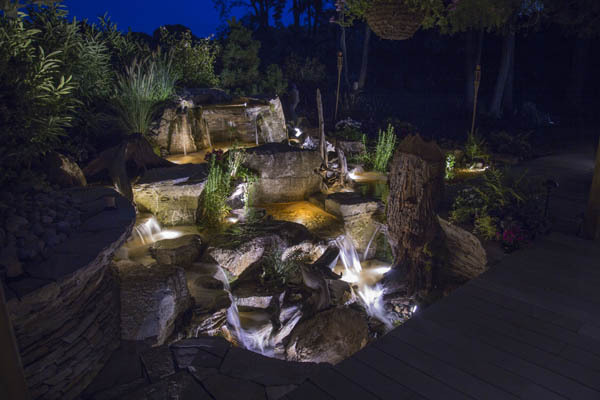 Water features are stunning during the day, but when pond and garden lighting is used to enhance evening views, you’ll find the landscape takes on a whole new dimension! Tuck a spotlight behind a waterfall and the feature takes on a magical feel. Used in the main portion of a pond, you’ll enjoy watching fish dart in and out of the lights. 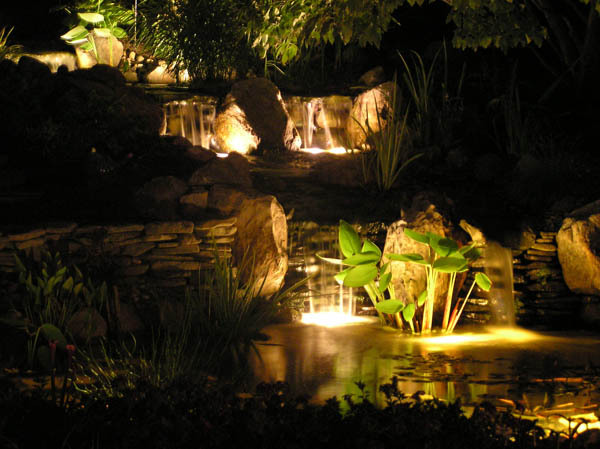 As the sun begins to set, pond and garden lighting creates a magical mood in the landscape. Think of that vacation you experienced at the beach, and the serene feeling you enjoyed watching the moon cast a glowing trail over the ocean’s surface. 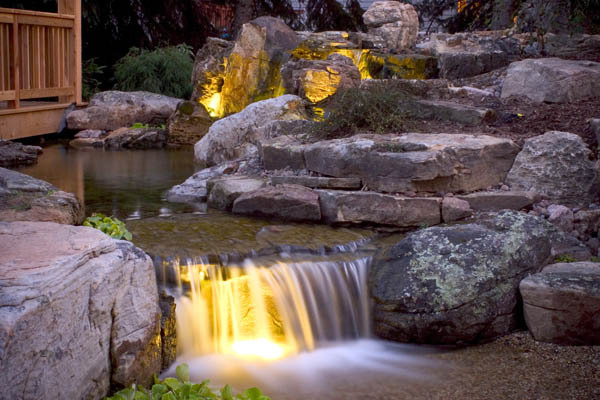 When you add waterfall or underwater lighting to your water feature, you extend your viewing pleasure well into the evening. You can add lights during the installation of your water feature, or add more later if you see dark spots you’d like to highlight. To make lightscaping easier, lighting kits are preassembled and pre-wired, making installation a snap. Simply plug in the transformer, and your lights are ready to go. You can also incorporate a photocell to put the lights on a timer. Check out this AMAZING Landscape Lighting Display at our Creative Center. The landscape lighting display features various types of landscape lighting as well as fire features. Truly lighting up your night and your life for all hours of enjoyment. The entire display area is outfitted with landscape lighting. We incorporated up-lights on the trees in the display area. There are wall lights on the veneered masonry walls and patio area. Path lights were installed along the flagstone walkway area. A few spot lights highlight featured areas like the fire fountains. The entire water feature has underwater lighting as well as spot lights throughout. Below is a project video highlighting the display during the day. There is a few paragraphs as well describing the various elements of the display. This Outdoor Living Space Display features various outdoor living services we provide. We featured water features, hardscapes, masonry, landscapes, outdoor audio, and landscape lighting. The main idea was to create a space where we could showcase our specialties for the public’s viewing pleasure. We encourage visitors to stop by and interact with this grand display. Night time viewing is also encouraged as the entire feature is lit up in the evening. In the future we plan to incorporate additional features to this project. At some point we hope to add an outdoor kitchen area as well as a fire-place. Upon entering the property, first thing to catch your eye is a fairly large-scale water feature. The water feature consist of an ecosystem pond. The water starts to flow from a spillway bowl fountain. The spillway pours into the bog filter. The water then flows down various cascading waterfalls. The waterfalls and pond were constructed out of 2 different types of boulders. We did this to show various options available. There is a gigantic boulder fountain that is incorporated into the pond as well. There is a skimmer in the pond the show functionality. The pond then flows over a zero edge waterfall into a large basin. Atop the basin is 3 fountains. 2 bubbling urn fountains as well as fire bowl fountain. The patio area incorporates different styles and colors of pavers. Along with different styles of boarders. There is 2 seating walls on either side of the patio area. Each seating wall has a mixture of stone and brick veneer and topped with flagstone caps. There is a very unique shed next to the patio area. Surrounding the patio are we installed an outdoor audio system as well. This system cranks out some serious sound. Stop by and have a listen! If you’re in the Lancaster area be sure to stop by and check it out!!! Visitors are always welcome. Fall is the perfect time for a landscape lighting design. The nights get shorter as the sun sets earlier. The weather however is still very enjoyable. A professionally designed and installed landscape lighting system can extend your enjoyment far into the pleasant fall nights! As well for those that enjoy the brisk weather sitting by the outdoor fireplace. There’s no reason your outdoor living area can’t be enjoyed year round.Landscape lighting extends the hours that you can enjoy your outdoors, as well as adds another dimension of BEAUTY and added security to your property. It provides the perfect accent to walkways, patios, retaining and seating walls, as well as those special architectural elements on your home and even inside your pond or water feature. Your outdoor living space can come alive at night with the use of Landscape Lighting. Often over looked and under used landscape lighting provides a benefit to your home that simply has to be seen and experienced to be believed. Whether it be dinner on the patio or those get-togethers with friends and family that last well into the evening. Landscape Lighting will provided you with getting the most out of your outdoor living space. After all, who doesn’t want to get the most out of their investment. Make lighting a priority. To schedule a consultation and see how we can make your outdoor living dream a reality. Please take a few moments to fill out our Pre-consultation Questionnaire. Fill out as much information as you can. Someone from our office will contact you shortly. This Driveway Entrance Landscape Renovation included installation of retaining walls, landscape beds, plants and trees, and landscape lighting per our landscape design. The retaining walls and pillars were constructed using concrete block and faced with stone veneer. Some tree removal, as well as grading and seeding of disturbed areas were also included. Low voltage lighting was also installed along retaining walls and throughout the surrounding landscape. This project was installed in Ephrata, PA.